If you're upgrading or retrofitting an earlier installation you may be able to save money by ordering just the components you need. Start with this Base Kit and select, al a carte, just the wire and connectors you need. 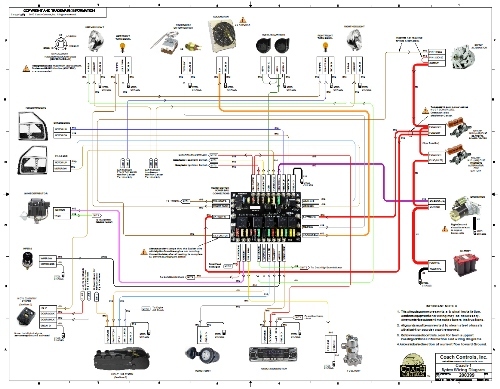 The Base Kit includes the same Coach-1 Power Center and laminated wiring diagram as our complete kit but does not include all the wire and connector kits that add significantly to the cost. Upgrading or retrofitting an older installation is recommended only for professional and experienced installers . 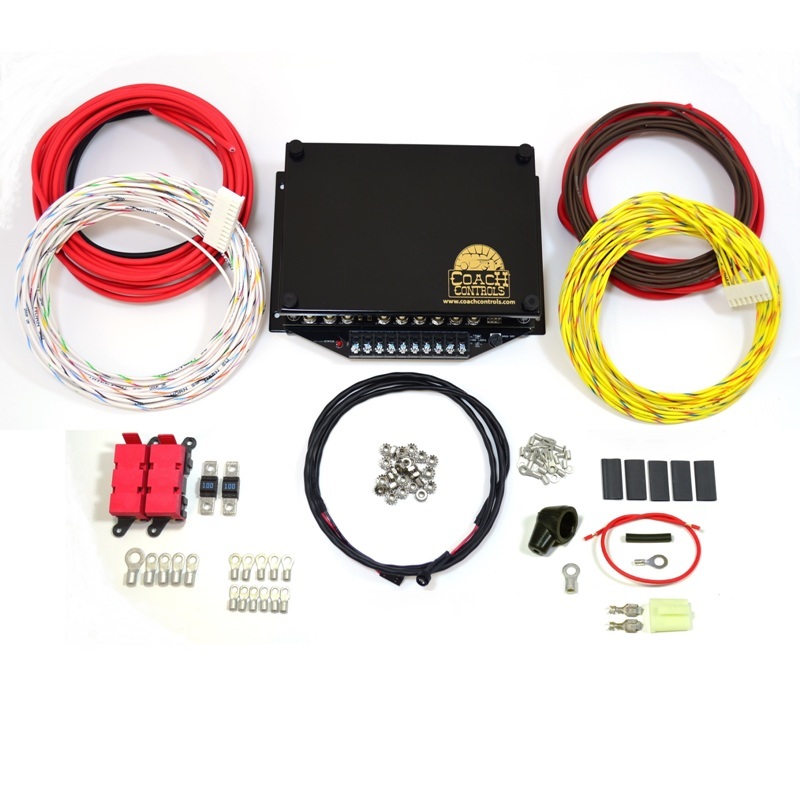 Coach Controls is very proud to introduce this state-of-the-art, high quality kit offering many features not previously available in the custom automotive market. Modern conveniences including automatic sensor-controlled headlights, single touch power window control, and lane change turn signals are just a few of the many features that make any ride more enjoyable to drive. The Power Center utilizes both high quality relays as well as solid state electronics to control and distribute power to various vehicle loads. This means no more time-consuming mounting and wiring add-on relays. The heavy duty ignition and headlight switches required by other manufacturers are not necessary with this kit. • Dimming Dome/Accent lights. These lights will also turn off automatically if you leave a door open, preventing battery discharge. • Heavy Duty Ignition, Headlight, and Dimmer switches are not required. Stock switches or a wide variety of quality switches can be used with this kit. • Pushbutton Start ready! No extra relays required, no complicated wiring necessary. • This kit supports 4 beam headlight systems (2 low beam elements, 4 high beam elements). • Dedicated 40 amp relay with thermostatic control input, compatible with all known electric radiator fans on the market, up to 30 amps continuous running current and 80 amps startup (inrush) current. • Alternator Exciter circuit, compatible with GM "SI" series alternators. • Heavy duty stud terminals for all heavy loads make solid, bullet-proof connections. • Rated for 100 amps continuous total load, about twice what most street rods require. • Most cars will not require any additional relays. • Compact size: 7-7/8" x 6-1/8" x 2-3/8" (LxWxH) makes mounting easy. • Mounting base and cover are satin black powder-coated aluminum.